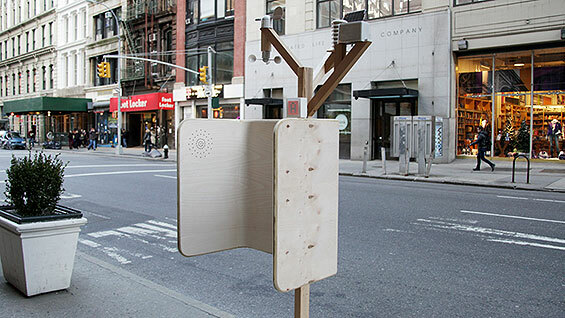 "Windchimes," a re-imagining of New York City's public pay phones as environmental sensors created by a group that includes Cooper Union graduates, has won the "Community Impact" award as part of New City's Reinvent Payphones design challenge and is one of six finalists for the "Popular Choice" award voted on by the public. (You can view the finalists and vote here until March 15.) The interdisciplinary team headed by Nick Wong (ME'11) includes Louis Lim (Art'11), Paul Miller (EE'10), and Eric Leong (ME'14) along with members of Parson's and New York University's ITP program. The competition invited, "students, urban planners, designers, technologists, architects, creators and legal and policy experts to build physical and/or virtual prototypes imagining a new public utility through payphone infrastructure," according to the Reinvent Payphones website. "I thought the Reinvent Payphones challenge was a really exciting problem dealing with technology on city streets. I liked the combination of technology and design and seeing how they fit into the urban environment," Nick Wong says. A group of judges gave entrants various awards for visual design, connectivity, creativity, functionality and community impact. The last award, "Popular Choice," is given to the contestant that acquires the most online votes from the public at large. The "Windchimes" design imagines the city’s existing 11,000 payphones as a distributed sensor network providing real-time and hyper-local record of the city’s rain levels, pollution and other environmental conditions. "The question I used to judge ideas was: 'What would this allow me to do that a smartphone would not allow me to do?' 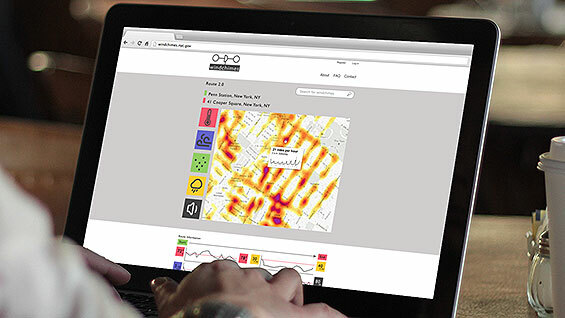 Static devices on city streets can provide environmental data and become a valuable resource that the city never had in any other form," Wong says. As he worked on "Windchimes" Mr. Wong realized that other Cooper people he knew would be perfect for additional aspects of the project. So he recruited Paul Miller to work on the electronics, Eric Leong to focus on the data collection and Louis Lim, a furniture maker and sculptor, to work on the structure. They ended up with a working proof of concept, something other competitors did not. "It was important that we have a physical, interactive object to present," Mr. Wong says. Mr. Wong imagines the data being used in ways both trivial, like calculating how to bicycle around the city with the wind always at your back, to more serious, like a mother of an asthmatic child learning about what neighborhoods have better or worse air quality. "We are excited about working on this," Wong says. "We think we have something real here and we will work on this even outside the competition."